ALWAYS READY WHEN YOU ARE. Ceftiocyl is a ready-to-use injectable version of the antimicrobial ceftiofur. Make your life easier with Ceftiocyl. Ask your veterinarian if Ceftiocyl is indicated for your herd. 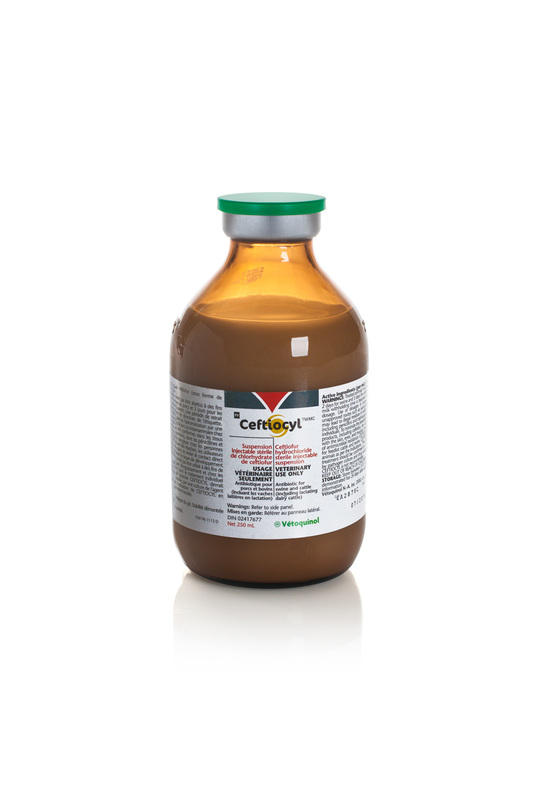 Ceftiocyl is indicated for the treatment of bovine respiratory disease (BRD, shipping fever, pneumonia) interdigital necrobacillosis (foot rot) and for the treatment of acute postpartum metritis. Each mL of Ceftiocyl contains 50 mg ceftiofur (as ceftiofur HCl). Administer by IM or SC injection. For bovine respiratory disease and acute bovine interdigital necrobacillosis, administer at a dosage of 1.0mg ceftiofur per kg body weight (1 mL per 50 kg body weight). Treatment should be repeated every 24 hours for a total of 3 treatments.